A few days into January, before I got consumed by a theater and when I still had access to things like "nights" and "weekends," I got a text from my friend Claire. It was a link to a recipe along with the message, "we should make this?!" "Totally," I replied. "This weekend?" So on a moderately chilly and almost-snowy Saturday, I threw two cookie sheets, my French rolling pin, and two bars of dark chocolate into my bag and hiked the six blocks over to Claire's apartment. A fresh bag of flour, a half-drunk bottle of wine, and a laptop blaring a questionably sourced episode of The Great British Bake-Off littered her kitchen table. "You ready for this?" she asked. "Did you actually read the recipe?" I replied. "You know, we need to let these chill for like 18 hours or something." "Yeah I just saw that. But I already bought all this butter, so we might as well just do it. Let's start!" And with that, Claire and I set off on a two-day, 27-step, deliciously French and highly caloric pastry-baking extravaganza that would ultimately net us around 36 perfectly puffed croissants and pain au chocolates (I don't have the exact yield because we were too busy squealing in delight and stuffing our faces to count how many we actually made). Neither of us had ever taken on such a complicated recipe before. I'd tackled a few multiple-course meals complete with homemade baked goods and I know that Claire can navigate a cake recipe like it's a peanut butter and jelly sandwich, but these were authentic French pastries. From scratch. However, we are two fairly intelligent women who like working our way systematically through complicated processes (it's no accident that in "real life" she is an opera singer and I am a stage manager), so we were able to find comfort and reassurance in following the recipe. And luckily, we work well together. I would call out instructions while she kneaded the dough for a while, and then I would take over dough duty while her arms took a rest. Stopping only for church (her) and rehearsal (me), we floured, we rolled, we folded, we chilled, we rolled again, we proofed, we rolled some more, we folded some more, and we proofed some more - and by Sunday evening we had ourselves four pans of what looked like pretty good chocolates and croissants-to-be. Then came the moment of truth: it was time to bake the pastries. Following another seemingly bizarre series of steps that included misting the oven with a last-minute-purchased spray bottle of water, we put the dough into the oven and watched our little rolls puff into golden crescents. I don't want to toot our own horns of plenty, but they were wonderful - flakey, buttery, and so warm they practically melted in our mouths. We tore one apart and the inside revealed such perfect little nooks and striated layers that I immediately understood why we had to proof and fold so many times. It was a little slice of Paris in my mouth - a city I hold near and dear to my heart, and one that Claire and I had visited together just last fall. Would I make them again? Probably not. They were truly and incredibly time-consuming, and she and I have other difficult baked goods to try our hands at next. But was it worth all the work? Without a doubt, yes. I experienced so much unexpected delight in making and eating and sharing the croissants that I nearly forgot just how many steps (and how much butter) it took to make them. While baking can be a solitary experience, sharing the process with a friend made it all the more fun - and now I am that much more excited to see what we bake up next. 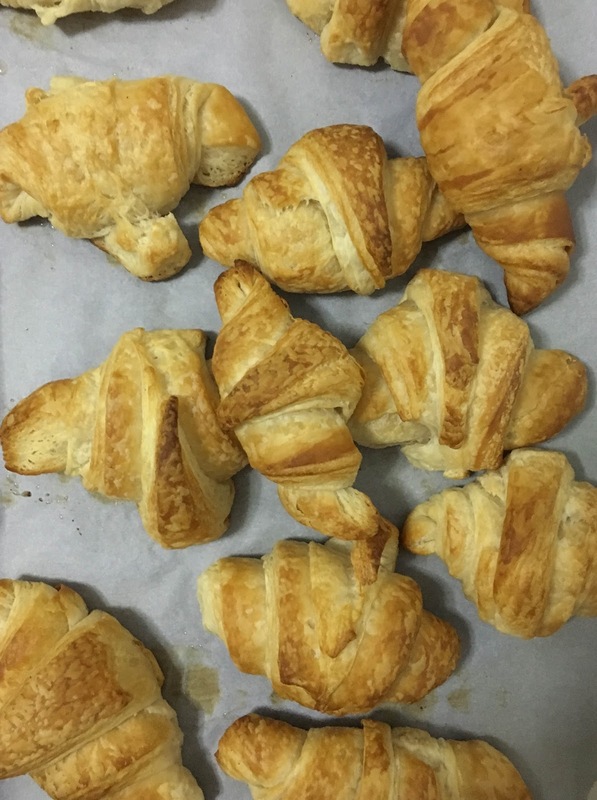 Want to try your hand at croissants? We used this recipe for the dough and this for the pains au chocolates. Let me know how they turn out!